Happy Tuesday!!! Today is day 19 of our #30daychallenge!!! This means we are in the home stretch with 11 more days to go in this March 30 day challenge and in the 1st quarter of 2018! How are things going? Are you on track to meet the goals that you set for yourself at the beginning of this year/month? How is exercising going? Have you been consistently getting a workout in at least 3-5 days a week? Are you having a hard time getting started on remaining consistent? Try setting a non-negotiable target of at least 8,000-10,000 steps a day or at least 30 minutes of #exercise per day. This plus implementing a Ketogenic diet (or whatever your dietary preference is i.e, Vegan, Whole30, Paleo) consisting of eating clean, organic or Non-GMO low carb vegetables/fruit, protein & healthy fats (no sugar) is essential. This plus integrating an intermittent fasting eating window of 12-8pm has helped me meet and sometimes exceed my weekly weight loss goal of at least 2 pounds per week. My question to you today is how BAD do YOU really want the RESULTS you are seeking? Are you willing to lay aside all excuses and get it done? Are you willing to try new strategies (Keto, HIIT and/or Intermittent Fasting (IF 16 hrs daily) to see if it will help you to get over your weight loss plateau? Do your research (Start here – https://www.healthline.com/nutrition/intermittent-fasting-guide ) and consult with your doctor to be sure it is safe for you to do. Lastly here are some tips to getting consistent exercise in daily. 1. Make exercising a priority, do what you have to do for you! Aren’t you worth it? YES YOU ARE!!! 2. Work out 1st thing in the morning before you go to work or right after! 3. While watching your must see TV walk/jog/run in place, do sit ups, push-ups, stretching, lift weights…etc. 4. Move whenever you get the chance, force yourself to take a walk break at work on your lunch or on your 15 minute break. 5. Get a workout partner and hold each other accountable to a work out time & place. 6. Get a Fitbit device (Check out their website to discover their devices http://www.fitbit.com ) and join a community of other people trying to meet step goals! Let me know when you do so I can add you as a friend & challenge you to daily step challenges through the Fitbit phone app. 7. Just DO SOMETHING! Even if it’s just for 10 or 15 minutes a day be consistent & gradually increase your workout time in increments of 5 minutes each week. Make it a goal to eventually get to 30-60 mins of exercise per day for at least 5 days a week. You CAN do it! I believe in you! Make the last 11 days of this challenge great, healthy & active!!! Follow me on my blog at http://www.monicaakerele.wordpress.com! Also follow me on Twitter @MonicaAkerele for more motivation & inspiration on your journey!!! #TGIF! From 3X to Living Large @40! Literally!!! TGIF! It’s Thank #God I’m Getting #Fit FRIDAY and I have 2 PRAISE REPORTS to share including Janacita Horton’s AWESOME results! It is #Day15 of our #Keto #30DayChallenge so that means we are already halfway through this month’s challenge! How are things going? Let me know what success and/or challenges you’ve had so far this month. Check out my YouTube video link below for an important update! Our next weigh in will be on September 21st! Let me know how are you are doing by replying to this post or by sending me a private message! Have a blessed, #active, safe and #healthy weekend!!! 1st September 2017 Weigh Day! Happy Monday! It is day 11 of our 30 day challenge! We are already 1/3 through September!!! How has it been going? Have you been sticking to eating clean, exercising, getting adequate sleep and reducing stress? Well I know it is not easy but I promise you it is worth it. Well it’s time for our 1st weigh in!!! Weigh first thing in the morning and let me know how things are going!!! Depending on what you see when you step on the scale tomorrow will determine what your next steps are. 1) Are you eating clean unprocessed whole foods? If not cut out all gmo, genetically engineered processed foods. Eat Organic or Non GMO whole foods instead. 2) Are you exercising at least 3-5 days a week? If not become consistent with this incorporating cardio, strength training, and/or HIIT training. Try to walk on your days off for at least 30 minutes to keep active. 3) Are you tracking your food intake daily? If not use MyFitnessPal, Fitbit or Fooducate apps to track your meals daily to ensure you don’t go over your calorie intake for the day? 4) Are you an emotional eater or do you feel you have a food addiction? Are you under a lot of stress? You may need to get some counseling. Getting counseling to help you work through some emotional issues is essential to your emotional health of which directly impacts your physical health. Don’t look at it as a bad thing because it isn’t. Nothing is wrong with taking care of yourself in this way. Getting counseling is an extension of self love. Call your HR dept to see if they have an EAP (Employee Assistance Program) that will give you free sessions to see a counselor. Most companies offer this as a benefit. 5) Do you find it challenging to figure out what to eat? Sometimes we need to see a dietician or a nutritionist to get a tailor made eating plan based on your health conditions, lifestyle etc… Once you have your eating plan work it!!! Most insurance plans offer over the phone Nurse/Health Coaching as a benefit. Call your health insurance to see if this is available as a covered benefit. How “BAD” Do YOU Want It??? #TGIF!!! 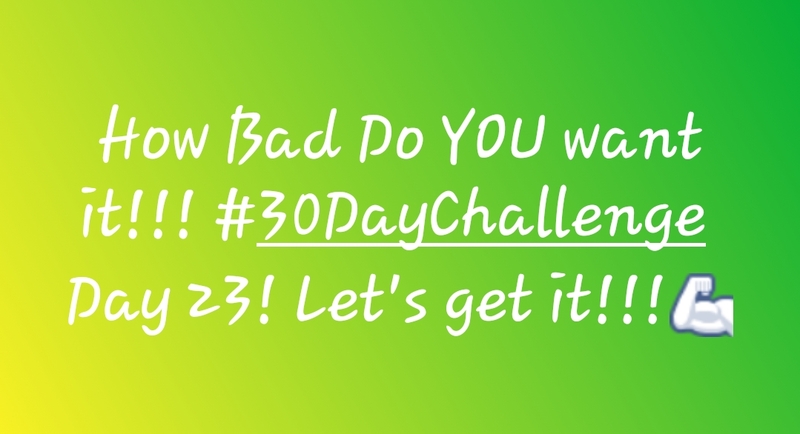 Today is day 23 of our #30daychallenge!!! This means we are in the home stretch, heading into the last week of this month’s challenge. How are things going? Are you on track to meet the goals that you set for yourself at the beginning of this month? How is the exercise going? Have you been consistently getting it in at least 3-5 days a week? Well for me it has been really consistent because I’ve set a non-negotiable target of at least 10,000 steps a day and at least 60 minutes of #exercise per day. This plus implementing a Ketogenic diet consisting of eating clean, whole & organic or Non GMO low carbs, protein & healthy fats (no sugar) has helped me meet and sometimes exceed my weekly weight loss goal of at least 2 pounds per week. So far this month I’ve lost 9 pounds. That’s an average of 3 pounds a week! My question to you today is how BAD do YOU want the RESULTS you are seeking? Are you willing to lay aside all excuses and get it done? Are you willing to try new strategies (Keto, HIIT and/or Intermittent Fasting (IF 16 HR) to see if it will help you to get over the plateau hump? Do your research and consult with your doctor to be sure it is safe for you to do. Lastly here are some tips to getting consistent exercise in daily. You CAN do it! I believe in you! Make the last week of this challenge great, healthy & active!!! Also follow me on Twitter & Instagram @MonicaAkerele for more motivation & inspiration on your journey!!! Weigh Day and Tips To Get You Over Your Weight Loss Plateau! Happy Thursday! It is day 15 of our 30 day challenge! Can you believe that we are halfway through June already? How has it been going? Have you been sticking to eating clean, exercising, getting adequate sleep and reducing stress? Well I know it is not easy but I promise you it is worth it. Well it’s time for our midpoint weigh in!!! Weigh in first thing in the morning and let me know how things are going!!! Depending on what you see when you step on the scale tomorrow will determine what your next steps are. 3) Are you tracking your food intake daily? If not use MyFitnessPal, Fitbit or Fooducate apps to track your meals daily to ensure you don’t go over your calorie intake for the day. Lastly here are 30 tips from Authority Nutrition that I think you should check out to see if it may help boost your weight loss. As always check with your doctor before trying any of these tips. New 30 Day Challenge Starts Tomorrow!!! Happy Hump Day!!! Today is the final day of our May #30Daychallenge!!! Can you believe that we are almost at the halfway point of 2017??? #OMG… This year is going by so fast!!! Question? Are you where you hoped to be when you set your goals at the beginning of the year? If not no fear and no worries there is always tomorrow. Get back on track and begin the June 30 day challenge starting tomorrow!!!! Weigh in first thing in the morning and let’s get started. 1) Make the decision to eat clean, unprocessed whole food. Eat organic and or Non-GMO where possible. Eat lean meat, veggies, fruit, nuts, seeds and smoothies with organic and or Non-GMO vegan protein powder. I plan to eliminate all dairy this month (including greek yogurt) and use almond or coconut milk as well as use vegan protein powder in my smoothies instead of whey. Don’t forget to drink water! 3) Get 7-8 hours of sleep!!! I cannot stress how important this is. Make this a priority in June! As always be sure to consult with your doctor before starting this or any other 30 day challenge.